It’s finally November or Movember should I say? If you’re not familiar with Movember, it’s an annual, month-long event involving the growing of mustaches held during November that raises funds and awareness for prostate cancer and other male cancer initiatives. 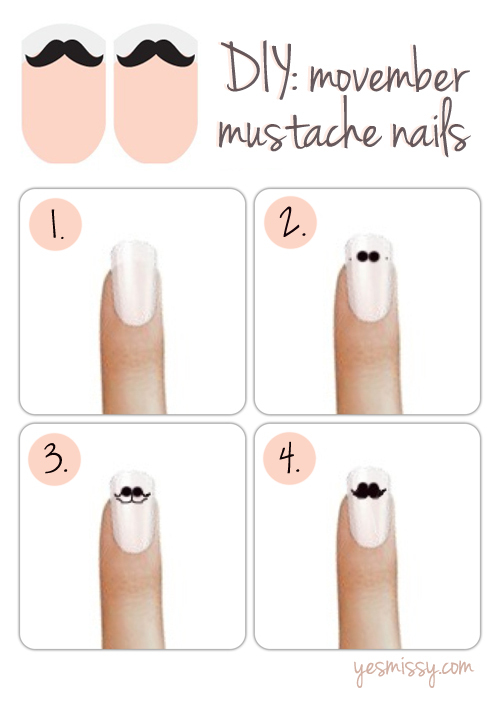 In the spirit of charity I decided to do a fun nail tutorial to create a mustache nails tutorial. So while our male counterparts start going their mustaches, we can create little mustache nails of our own. You’ll need two colors of contrasting nail polish and a nail dotter (or toothpick). If you’re not too steady with the nail dotter. I would suggest using a Sharpie, yes you read right – Sharpie permanent markers makes a great nail art pens! Plus if you make a mistake, you can remove it with a little rubbing alcohol that doesn’t take off your base coat polish. Start with a base coat and base color. Then make 2 large dots next to each other in the center of your nail. Then make 2 tiny dots on the outer side of the bigger dots. The small dots will serve as markers for where your little mustache will end. Draw a half circle or “U” from the left side of the larger left dot to the small dot. Then draw another half circle starting on the right side of the larger left dot to the small dot. Do the same to create the right side of your mustache. Then fill in your mustache! I’ll have to say, that is really pretty cute. I might try that.